I would rate this beach as "Good" for the amount of jewelry grade glass found. We thought it was excellent for the wonderful variety of glass, pottery, and ceramics that we found. Lots of unusual colors, big chunky old glass, and lots of perfectly smooth, frosted pieces. The beach that runs along the bay is small in length, and very rocky in the places we were most successful. My best find of the day was a beautiful bottle stopper in mint condition. I also found a nice, albeit small, smoky blue piece, a few pieces of jadeite, and some very nice aquas. 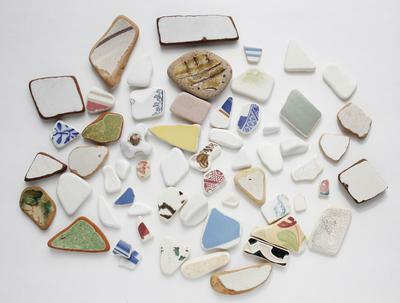 I live those pottery pieces; I wish I could see a larger resolution image! Fabulous finds! Been to Crete a few times but in those days I wasn't a Seaglass hunter lol! Must go back soon. Thank you for your report on Chania sea glass, Jennifer. 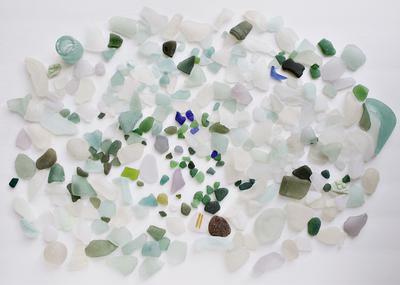 Greece offers so many possibilities for sea glass an other beach finds. However, with thousands of beaches, not all with the conditions to produce good beach glass, reports like this one with photos and specifics are really helpful. Want to go to Crete, anyone?